At Indigo IT our focus is ensuring that our clients are getting the most from the technology systems their business relies on. 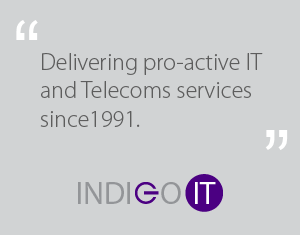 Based in Lightwater & Central London we have been delivering pro-active IT and Telecoms services since 1991 to clients in a wide range of business sectors. Over this time we have developed a range of skills and services which allow us to meet the needs of our clients. Our experienced and friendly team are always on hand to deal with things when they go wrong and offer trusted advice on new technology as and when required. Communication is a key part of our ethos ensuring that we keep in touch with our valued clients and talking to them in plain English is extremely important to us.